Most health problems, including obesity, ADD/ADHD, nerve and joint pain, stroke, diabetes, heart disease, migraines, thyroid issues, dental issues, and cancer are all rooted in inflammation, which must be properly managed if you want to be healed. 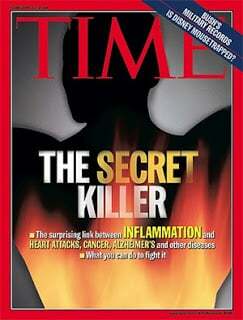 In 2004, Time Magazine cover article named, Inflammation: The Silent Killer, reported that there was a general consensus among doctors that Inflammation is the underlying cause of chronic disease and chronic diseases are what makes up about 90% of doctor’s visits. Most people think of inflammation as bumping their elbow against a wall and have immediate swelling, but that is solely an acute injury when many forms of inflammation are chronic due to repetitive physical injuries, stress or toxicity. Although we need inflammation to heal, but we also need anti-inflammatory compounds to be present when there is too much inflammation to create balance. Both inflammatory and anti-inflammatory compounds come from fat. There are good fats and bad fats. The pro inflammatory compounds come from Omega-6 fatty acids, while Omega-3 fatty acids are precursors to anti-inflammatory compounds in the body. Research states it is ideal to have a 1-to-1 ratio to keep things in balance. However in America today our diets and lifestyle are are about 20:1 in favor of Omega-6 dominance per a Feb. 2016 report in Chiropractic Economics. The good news is that one can correct this ratio and decrease these inflammatory chemicals. Increasing greens, while decreasing sugars and chemicals, as well as supplementing with vitamins you can create a better balance of good vs. bad fats. Some of the top supplements we recommend to combat inflammation are Omega-3’s, Curcumin, OPC and Resveratrol. You can reference the following link for more information on these supplements, as well as order these top grade products.